14-18 NOW, the UK’s official arts programme for the First World War centenary, and Imperial War Museums have commissioned internationally acclaimed filmmaker Peter Jackson – of The Lord of the Rings trilogy and The Hobbit fame – to create a new film about the First World War. The new work has been created exclusively with original, archive footage from the Imperial War Museums’ film archive and audio from the BBC archives. The film will be broadcast on BBC One following a UK-wide premiere as part of the BFI London Film Festival in 2018. The BBC will accompany the film with a ‘making-of’ documentary with behind-the-scenes footage, interviews with Peter Jackson and an in-depth look at the creative and technical process behind the work. The Academy Award-winning director spent months immersed in Imperial War Museums’ original First World War footage and BBC audio to discover stories and perspectives on the war never-before presented to the public, and has brought them to life using the techniques he has become famous for. 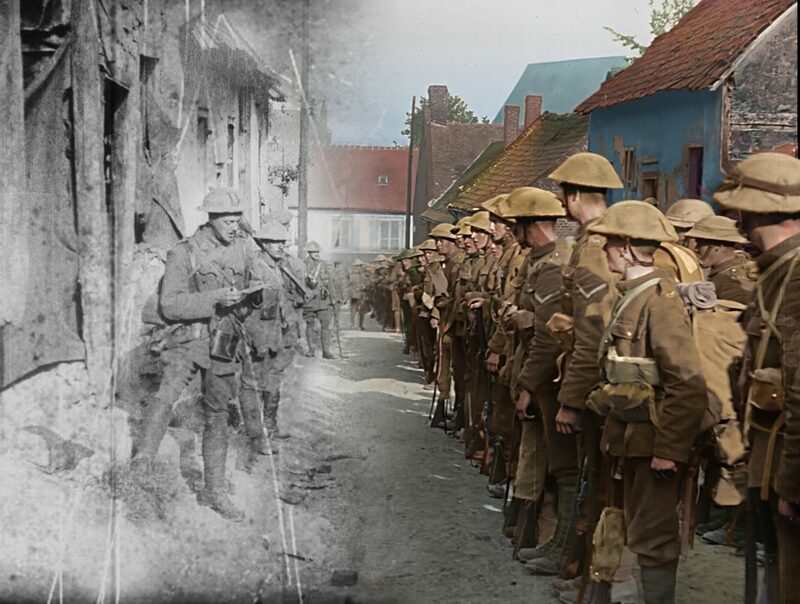 Each frame of the film has been hand-colourised, 3D-digitised, and restored with modern production techniques so that it is as impactful today as it would have been when originally presented in cinemas to a wartime audience during the First World War. The careful treatment and restoration of the original footage has resulted in a unique film, bringing back to life the stories that were captured in moving footage a century ago. The film will also feature original audio sourced from the BBC archives, giving audiences a chance to hear from the people who experienced the First World War, telling their stories in their own words. Young people form a central part of the film’s distribution with learning resources that will reach all secondary schools in the UK. A copy of the film will be given to every secondary school for the 2018 Autumn term. The programme will also include curriculum-linked learning materials presented with TES (Times Educational Supplement), and the film will feature in the Into Film Festival which takes place in the lead-up to 11 November 2018. The film has been produced by WingNut Films in New Zealand, who are world-renowned for their innovative work on The Lord of the Rings, The Hobbit and King Kong, and is Executive Produced by BAFTA Award-winner Tessa Ross at House Productions. Trafalgar Releasing will be coordinating a simultaneous screening of the film in cinemas around the UK to coincide with the UK premiere. 14-18 NOW is funded by the National Lottery through the Heritage Lottery Fund and Arts Council England, and by the Department for Digital, Culture, Media and Sport. 14-18 NOW is an independent programme hosted within Imperial War Museums. 14-18 NOW would like to acknowledge its partnership with the BBC on projects in the 2018 season. Co-commissioned by 14-18 NOW and the Imperial War Museums. Special thanks to Matthew & Sian Westerman with additional support from The Taylor Family Foundation, The Moondance Foundation, British Council, Jacqueline & Richard Worswick and one anonymous donor. With support from the National Lottery through Arts Council England and the Heritage Lottery Fund, and from the Department for Digital, Culture, Media & Sport.